Completely Transform Your Rental Without Actually Changing Anything! With a strategic location and a booming economy, the Kingdom of Bahrain has managed to attract many Kuwaiti real estate companies. Considered by many as a central real estate hub, the Bahraini market will only grow in the coming years. This is why Kuwaiti real estate companies are not only operating in Bahrain but also setting up offices there. The Kingdom is ripe with opportunities for investors. It is also famous for its smooth laws and regulations that allow businesses to thrive. Here are a few of the Kuwaiti real estate companies in Bahrain and their fascinating projects. Established in 1994, ALARGAN quickly grew as an innovative and successful real estate developer. After securing its roots as one of the most important Kuwaiti real estate companies in Kuwait, ALARGAN soon spread throughout the GCC. The company then opened offices in Oman in 2003, Bahrain in 2005, and Saudi Arabia in 2007. Following a thorough analysis of the Bahraini real estate market, ALARGAN Bahrain was established. Furthermore, as part of the company’s dedicated vision, every project aims to deliver the highest quality construction of middle-income developments. The company’s first middle-income residential project sold out within only nine months of its launch. ALARGAN Bahrain is now developing two other residential and commercial projects aimed at the middle-income sector. 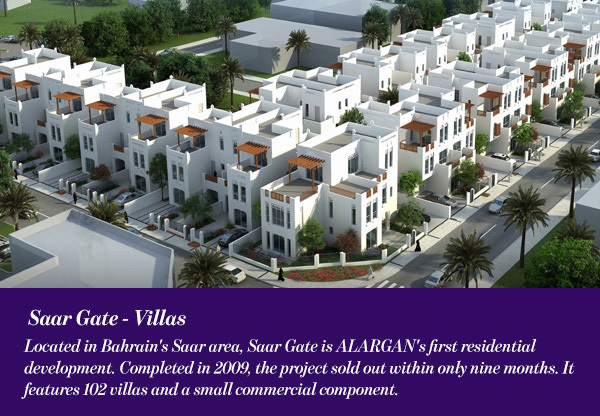 Located in Bahrain’s Saar area, Saar Gate is ALARGAN’s first residential development. Completed in 2009, the project sold out within only nine months. It features 102 villas and a small commercial component. Valued at 7,928,900 KD, Saar Gate covers a built-up area of 22,654 square meters. 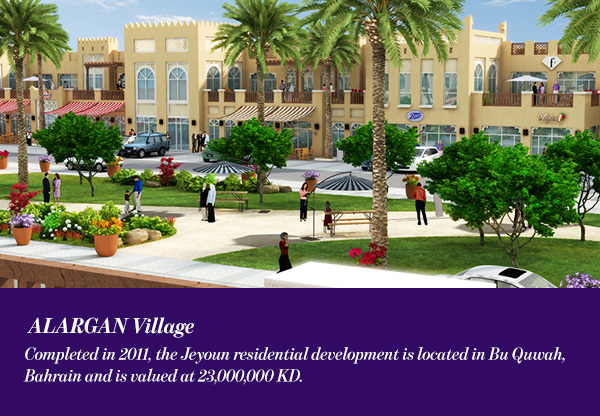 Completed in 2011, the Jeyoun residential development is located in Bu Quwah, Bahrain and is valued at 23,000,000 KD. Located within proximity to the major highways Sheikh Khalifa Ben Salman and Sheikh Essa Ben Salman, the development boasts 82 townhouses. Jeyoun also features 18 unique layouts with a built-up area of 20,000 square meters. A retail and commercial component of the Jeyoun project, this development is located in Bu Quwah with direct road access to the city. A six commercial block building, the project covers an area of 11,000 square meters. 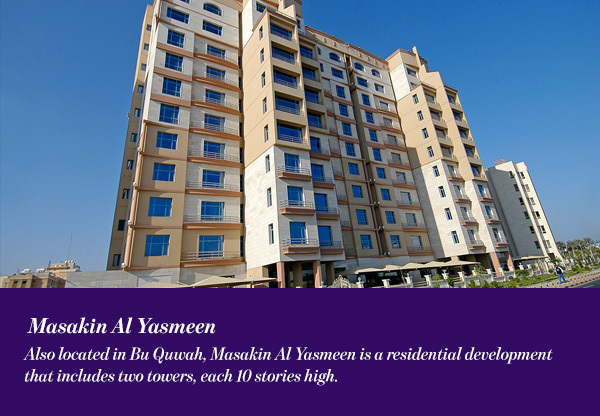 Also located in Bu Quwah, Masakin Al Yasmeen is a residential development that includes two towers, each 10 stories high. The towers will include small apartments, medium-sized apartments, as well as luxurious penthouse suites. In addition to a 1,578 square meter retail and commercial area on the ground and mezzanine floors of the complex. Established in 1968, the Commercial Real Estate Company K.P.S.C (Al Tijaria) was later restructured in the year 2000. Listed on the Kuwait Stock Exchange (KSE) in 2004, the company is considered one of the largest kuwaiti real estate companies, as well as one of the main real estate developers and management companies in the GCC. It currently operates in Kuwait and Bahrain and will continue to expand in the GCC & MENA regions and Internationally. 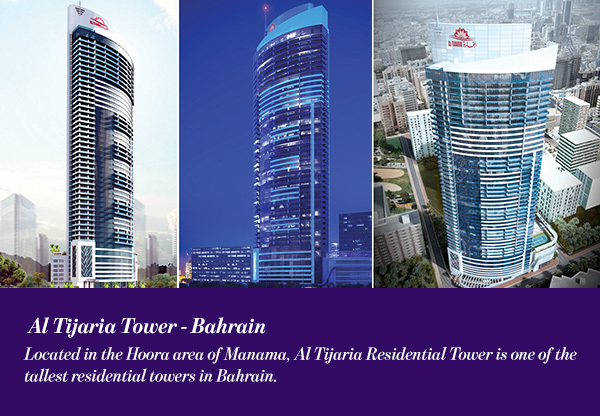 Located in the Hoora area of Manama, Al Tijaria Residential Tower is one of the tallest residential towers in Bahrain. At 46-storeys high, the tower includes 351 residential units, all of which boast a sea view. Units include studios, one, two and three bedroom units. Moreover, the parking area covers 6 floors while one floor is dedicated to amenities and facilities. Ten floors hold the Symphony Furnished Apartments while 39 floors contain freehold units. As for the amenities, the include a business center, café, kids play area, separated gyms for men and women, and basketball court. In addition to a spa, swimming pool, Jacuzzi and outdoor dining restaurant. Due for completion in mid-2019, the project covers an area of 3,858 square meters. Situated opposite to The Diplomatic Area, it is just 10 minutes away from Bahrain International Airport and 20 minutes away from King Fahad Causeway. With an active role in both the Kingdom of Bahrain and the State of Kuwait, the Kuwaiti Bahraini Trading & Contracting Co. operates in residential real estate development. Furthermore, the company works alongside leading interior designers and architects. 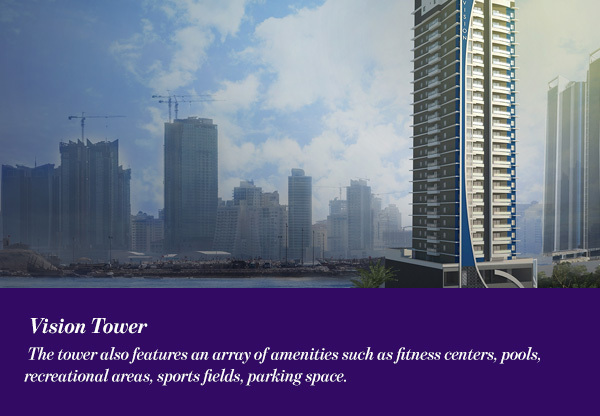 Located in Juffair, Vision Tower is 27 floors high and boasts over 120 residential units. The tower also features an array of amenities such as fitness centers, pools, recreational areas, sports fields, parking space. Vision Tower offers a variety of apartment models for residents to choose from. Units 1 and 2 have an area of 114 square meters. They include two bedrooms, two bathrooms, a living room, a European kitchen, and balcony. Units 3 and 4, 66 square meters, feature a bedroom, bathroom, a living room, a European kitchen, and balcony. Unit 5 is an 80 square meter apartment with a bedroom, bathroom, a living room, a European kitchen, and a balcony that overlooks the pool. Finally, Unit 6 boasts two bedrooms, two bathrooms, a living room, a European kitchen, and balcony across an area of 103 square meters. 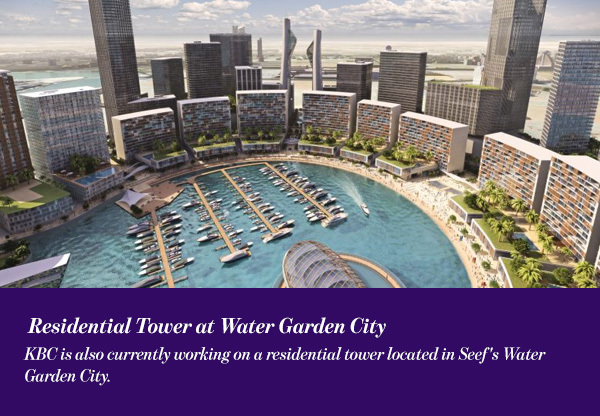 KBC is also currently working on a residential tower located in Seef’s Water Garden City. The 26-storey tower will cover an area of 30,000 square meters.